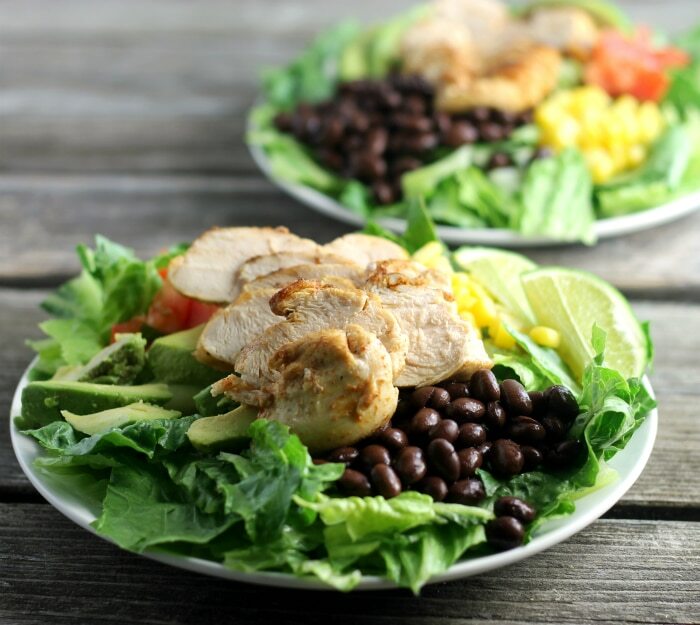 Southwest chicken salad with chicken, black beans, corn, and tomatoes is full of flavor and is a meal in itself. I try to eat a salad with my dinners on most nights. They usually consist of a variety of different lettuces and salad dressings. It is not that I love salads that much, but I like to have something healthy with my last meal of the day. But this southwest chicken salad takes my plain old salads to a whole new level. I don’t eat a lot of salads when I go out to eat, I am not sure why. Maybe it is because my favorite thing to order when I go out to eat is fish and that is usually what I order. But Mike is on the road traveling for work and he is always eating out. So there are times when he does order a salad for his meal. Don’t tell him this but it surprises me that he does because when he is at home, salad is one of the last things that he will eat. Mike is the one that came to me and said that we had to make this southwest chicken salad at home. Believe me, he didn’t have to ask me twice, I was all for it. 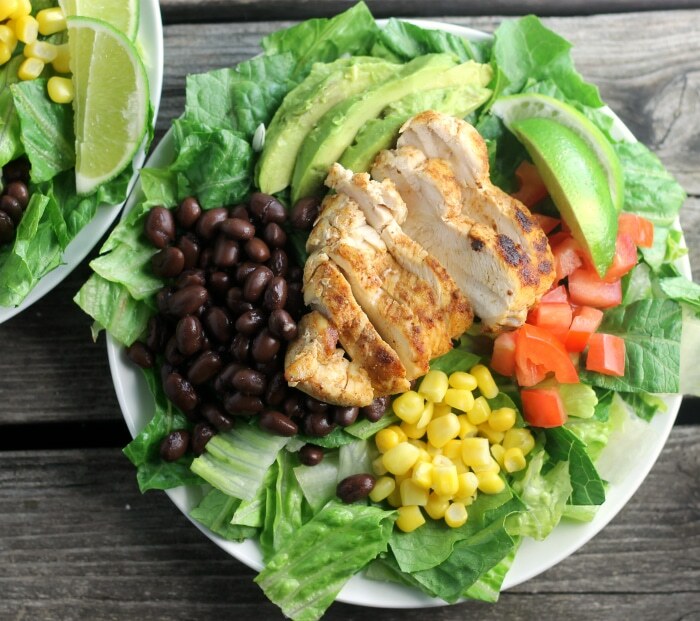 The one thing that I like about salads such as this southwest chicken salad they are delicious and really don’t take a lot of effort. You can have them in no time and they are perfect for any day of the week. 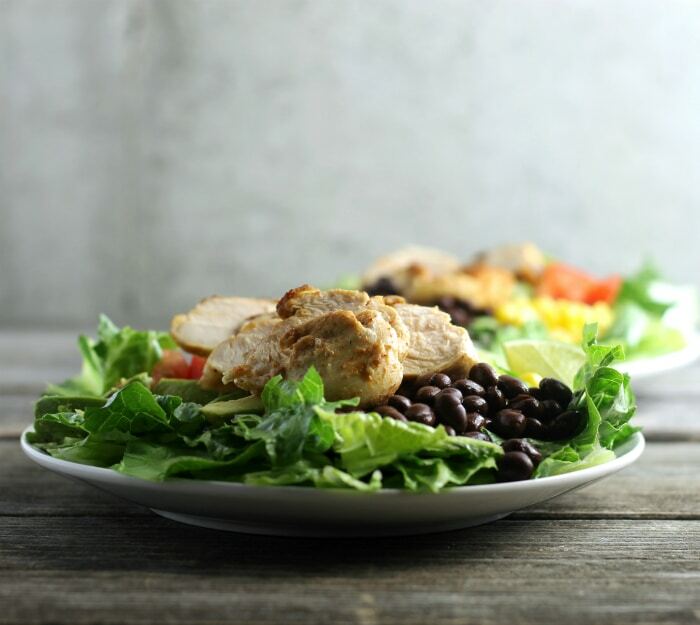 For this salad, the chicken is made in a cast iron skillet and cooked quickly. The chicken is seasoned with cumin, garlic powder, onion powder, chili powder, paprika, salt, and pepper. It is garnished with chopped tomato, corn, black beans, avocado, and slices of lime on the side. I made a southwest ranch dressing for this recipe, but if you don’t have the time you can buy the salad dressing at the store. I had intentions of having red onions on the salad, but the onion was forgotten until after the salad was eaten, I am sure it would have been a wonderful addition, but the salad was delicious without it. So it will be your call if you add the red onion or not. Southwest chicken salad delicious healthy and full of southwest flavor. Combine the cumin, garlic powder, onion powder, chili powder, paprika, salt, and pepper. Take the seasonings and rub over chicken. In a cast iron skillet heat the olive oil over medium heat, place the chicken in the heated skillet. Brown chicken on both sides and continue to cook until chicken is not pink in the center, about 15 minutes. Add the minced garlic, mayo, sour cream, buttermilk, lime juice, cumin, and parsley in a food processor. Pulse the ingredients until well blended. Slice the chicken and place 1/2 chicken breast on each salad. 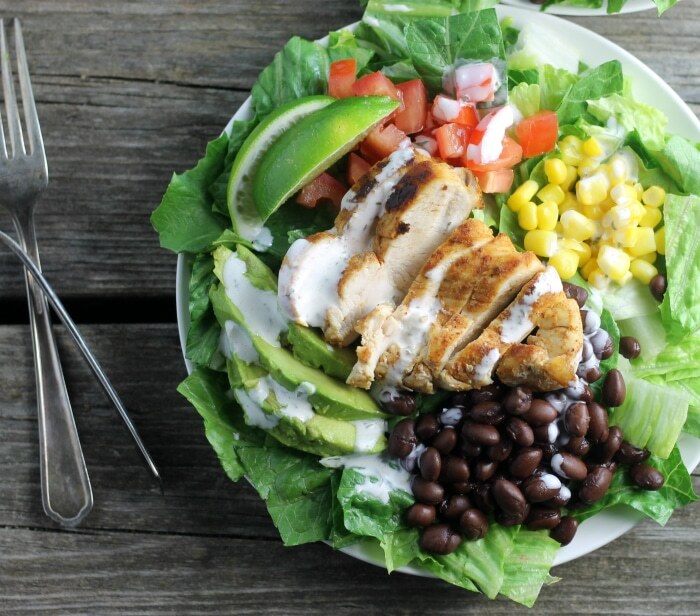 Drizzle the Southwest ranch dressing over the salad. Very very delicious and good for you too! I hear ya, Dawn! Salads don’t necessarily call to me as my first choice, but they can be so tasty. I love this southwest version, and I definitely need to make it appear in my kitchen. (And don’t worry about the missing onion…I have totally done that when making recipes, too!) That dressing sounds simple and delicious, too! Beautiful salad Dawn, colorful and nutritious…I love the idea of beans and corn…indeed it makes a great meal. I’m the one in our family ordering salads—I’d be shocked if Bill ever did! I’d love your Southwest chicken salad for dinner or lunch—and your homemade dressing sounds yummy, too. Beautiful photos, Dawn! This is wonderful — a complete meal in itself. I love main dishes salads at this time of the year, and this is excellent. Thanks! More excellent shots! Love it. This is a great salad that I would love for lunch tomorrow!. I love the chicken, spices and dressing! Southwest works and so does ranch. Thanks for the recipe!